Monday, June 11, 2018 ~ 10:30 a.m.
Sunday, June 10, 2018 ~ 3:00 – 5:00 p.m.
Doris E. Schneider, 96, of Ashland, NE, died Sunday, June 3, 2018 in rural Greenwood, NE. She was born April 13, 1922 in Greenwood, NE to L. Dewey and Amy (Hammer) Parks. Doris graduated from Ashland High School in 1940. On January 14, 1942, Doris was united in marriage to Francis Schneider in Marysville, KS. She worked for Woodmen Accident and Life Insurance Company in Lincoln as an accounting clerk for over 25 years. Doris was a member of the American Legion #129 and VFW #9776 auxiliaries and she was a Girl Scout leader with Luella Hahn for 20 years. Doris attended Cedar Hill United Methodist Church and she was active at the Senior Center. 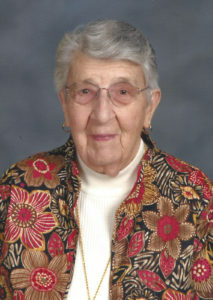 She always enjoyed boating, swimming, painting, making stained glass, knitting and crocheting. She is survived by daughter, DeLilia (William E.) Lodge of Hammond, LA; grandson, James Bernard (Mei Su) Lodge of Baton Rouge, LA; great-grandchildren, Melanie Mei Lodge and William Su Lodge; sister, L. Faye Fleeman of Hawthorne, CA; brother-in-law, Darwin McAfee of Toms Brooke, VA; many nieces and nephews. She was preceded in death by husband, Francis Schneider; parents, L. Dewey and Amy Parks; sister, Edna McAfee. Rest in Peace Dear Lady. Friendships never die,you will be remembered always. To the family,sorry for your loss,may you find comfort in all your memories. She was a very sweet lady. I’ll miss her. Our times of fun working together and going to Thomas Fitzgerald Home will never be forgotten. Enjoy meeting all your friends in heaven. You deserve the best. thank you carl hammer for sharing your ‘memory’. one of my memories is how she would send my siblings send me cards when we were young…birthday cards, Christmas cards etc. when we were living in other parts of the world. this is how we got to know her. she was my aunt.